In the hearts of almost every member of the New York University Shanghai Class of 2017 lies the East China Normal University campus. More so than the campus, the surrounding streets provide the backdrop for the Class of 2017’s first year in university. Walking through the streets again for the first time in over a semester, I was overwhelmed by nostalgia for the creepy side gate and the nighttime noodle lady across from KFC; but, as I was walking, I couldn’t help but be moved by the incredible change the area has undergone. While the noodle lady was still there, the rest of her cohort seemed to be missing. I took solace in the fact that for the most part, that particular crossroad was still reminiscent of the former “side gate street food.” The seafood stalls and chao mian family still operated just outside of KFC’s doors, picking up customers the closed KFC failed to serve. 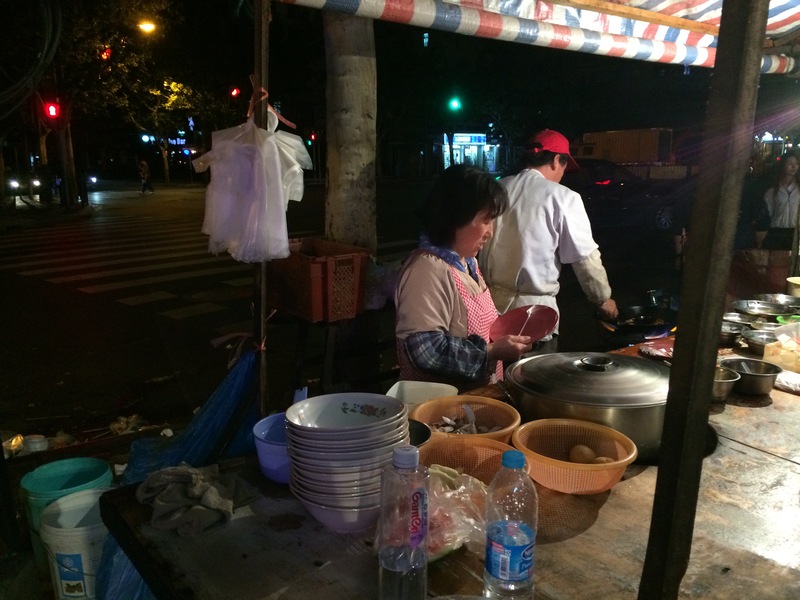 One of these dutiful cooks is from Anhui province and has been serving street food in that location for 10 years. She works the stand with her husband and her son, who has grown up watching her cook for the swarm of Chinese and international people studying at ECNU during the day and stuffing their faces at night. Despite her regular position, she claims she does not have regular customers. It seems she’s just an end to a means for the often intoxicated passersby. She fades into the shadows after the customers have satisfied their hunger. 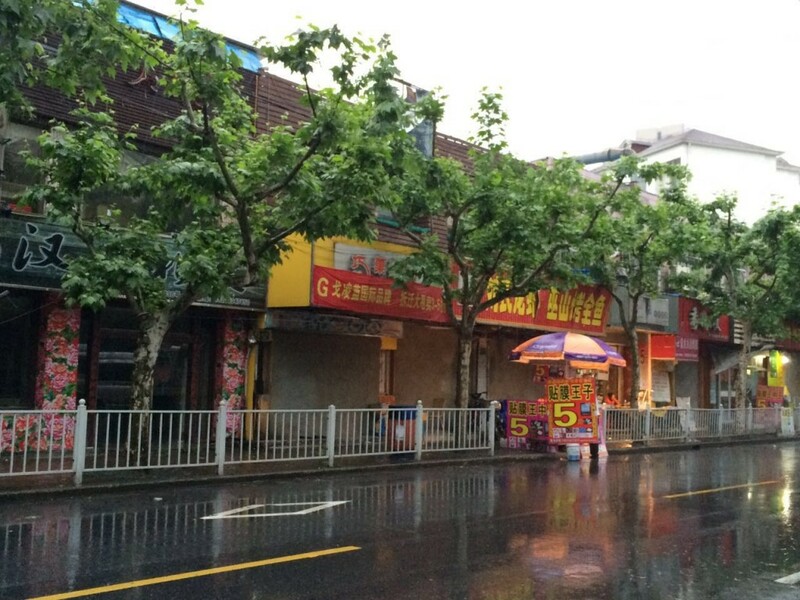 Further down the street, on the corner of Jinshajiang and Zaoyang road, the changes are even more evident. 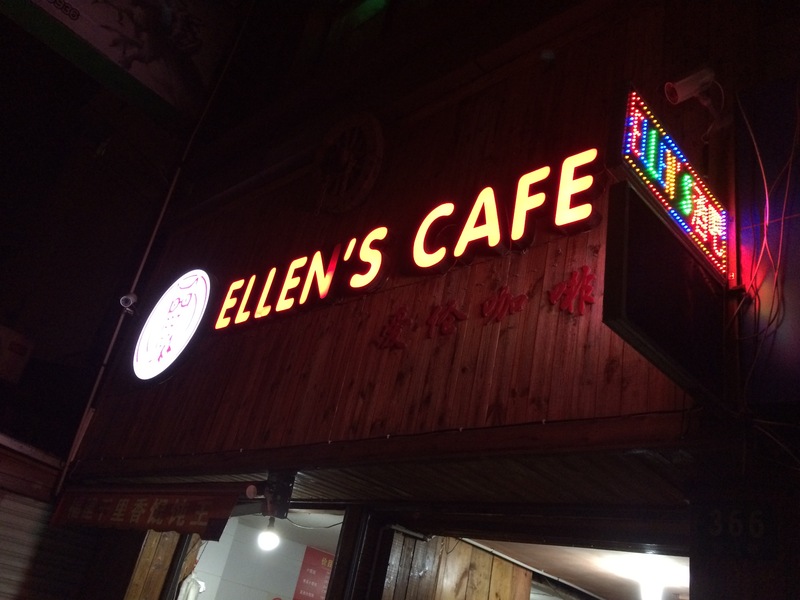 Last year, Ellen’s Bar relocated to a small, rather inconspicuous location down Zaoyang road. While the bar isn’t obvious from the corner, after taking a few steps in the right direction the bar becomes hard to miss. Its raucous, thumping music can be heard from the adjacent building. Although street food existed on the corner before the bar relocated, the options have since quadrupled. In addition to the halal kebab guy and miscellaneous noodle lady number 3, there was another halal kebab guy, an ordinary skewer guy, and another noodle lady. Most surprising of all, there was a brand-new Family Mart. According, this street food was much better than anything we sampled in Pudong, and I had to agree. The food was actually better than it was even last year. 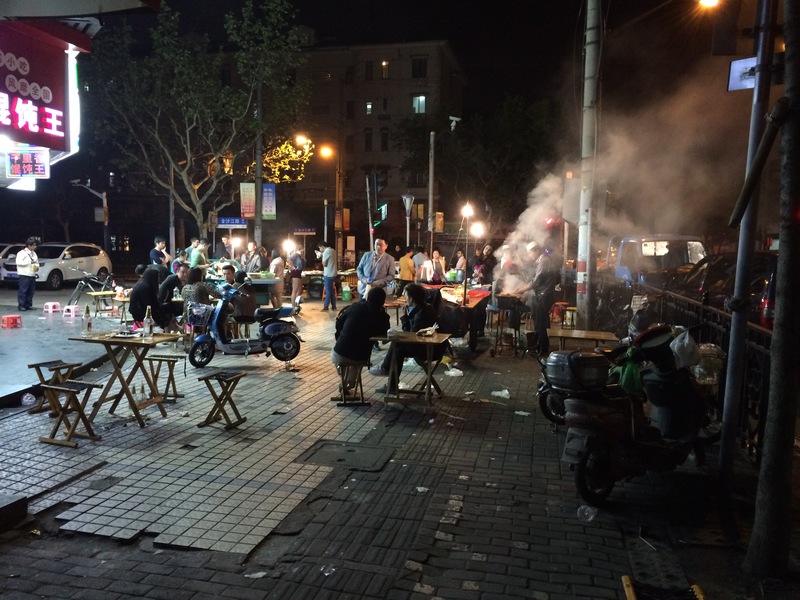 I also found it interesting that these street food stalls appeared around the bar. 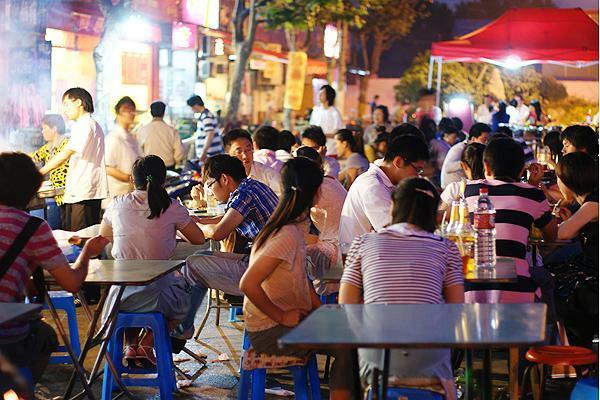 I also noticed that street food has a habit of congregating near bars (to service the post-booze crowd) and 24-hour convenience stores (most probably to service night walkers and students pulling all-nighters). Although this area changed for the better, just around the corner, on 枣阳路，tremendous change and a property battle between small shops and ECNU left the back gate desolate. Cici, who went to the back gate and interview the one remaining skewer guy, provided the details. Previously, the back gate of ECNU used to be just as lively as the street food stalls outside of the side gate currently are, but the government plans to turn the street into a host for stationary shops (as if Shanghai doesn’t already have enough, and as if Fuzhou Lu isn’t filled to the brim with stationary and art shops). Apparently, the government wants to remove the street food because it isn’t “decent.” The stationary shops would be a much more respectable option, and their proximity to the university would guarantee business for the shops. In 2013 the local government decided to run for the title of “Nation’s Most Hygienic City.” In order to do so, they began driving the street vendors away and setting up literal and figurative barriers (such as the gate beside the sidewalk in the picture above) to effectively squeeze out the vendors. Whenever the 城管(Chengguan, “city managers”) see the street vendors, they pack their stuff and give them heavy fines. ECNU noticed these changes and extended the opening hours of the front gate (on North Zhongshan Road). It also diversified the food options in the new cafeteria and extended the opening hours. Previously, the cafeteria closed at 6PM, now it closes at 11PM. The school seems to be attempting to comfort the students for the closing of the back gate. 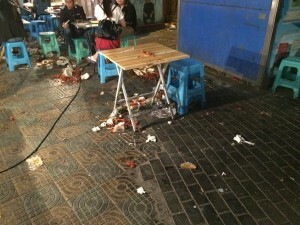 It’s as if the street workers are worth less than the refuse their stalls leave behind. The government can deal with the pollution because it is easily cleaned up, low-waged migrant workers go through the streets in the still-dark hours of the morning sweeping up the countless skewer sticks, styrofoam boxes, and discarded tissues left by the drunk, hungry gastronomes the night before. The stalls, however, are much harder to clean up. 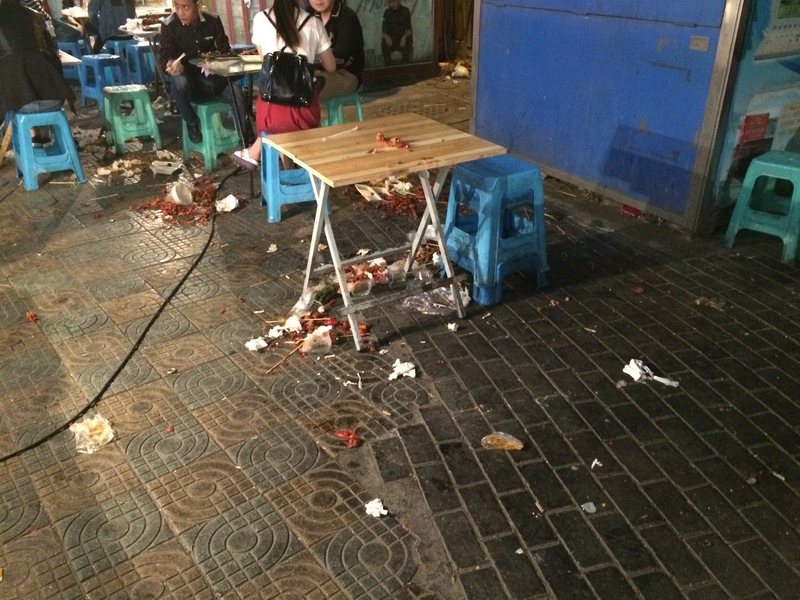 Cleaning up the street food means not only forcing the vendors the uproot and attempt to find another place to make a living, but also forcing the population to change its dietary habits. According to the government, just as the garbage is bad for the physical environment, the street vendors are bad for the social environment. They encourage congregation, and though this congregation does not usually have political leaning, there’s always the potential for politics to enter the picture, especially considering the controversial nature of the street food lifestyle. In this post,we bid farewell to the back gate of ECNU, because by this time next year, barring a miracle, it will have disappeared completely. The side gate, however, still seems to be going strong and we wish it the best for the future.